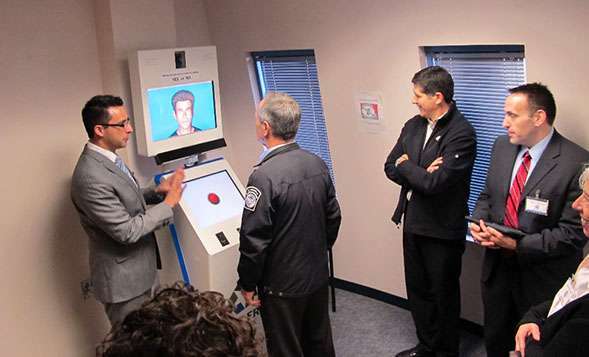 When you engage in international travel, you may one day find yourself face-to-face with border security that is polite, bilingual and responsive—and robotic. The Automated Virtual Agent for Truth Assessments in Real Time (AVATAR) is currently being tested in conjunction with the Canadian Border Services Agency (CBSA) to help border security agents determine whether travelers coming into Canada may have undisclosed motives for entering the country. "AVATAR is a kiosk, much like an airport check-in or grocery store self-checkout kiosk," said San Diego State University management information systems professor Aaron Elkins. "However, this kiosk has a face on the screen that asks questions of travelers and can detect changes in physiology and behavior during the interview. The system can detect changes in the eyes, voice, gestures and posture to determine potential risk. It can even tell when you're curling your toes." Here's how it would work: Passengers would step up to the kiosk and be asked a series of questions such as, "Do you have fruits or vegetables in your luggage?" or "Are you carrying any weapons with you?" Eye-detection software and motion and pressure sensors would monitor the passengers as they answer the questions, looking for tell-tale physiological signs of lying or discomfort. The kiosk would also ask a series of innocuous questions to establish baseline measurements so people are just nervous about flying, for example, wouldn't be unduly singled out. Elkins began working on AVATAR when he was a Ph.D. student at the University of Arizona. As the deception detection project grew more advanced and more sensors were added, more data about the interviewee was analyzed. When Elkins became an assistant professor at SDSU in the fall of 2016, his work moved with him. Here, he is in the process in completing construction of his lab where he plans to continue researching and teaching students about artificial intelligence. "We've come to realize that this can be used not just for border security, but also for law enforcement, job interviews and other human resources applications as well," Elkins said. "We continue to make improvements, such as analyzing the collected data using Big Data analysis techniques that make AVATAR a potentially valuable tool across many industries." In the meantime, Elkins is looking for a government agency willing to utilize the technology in a real-world application. "AVATAR has been tested in labs, in airports and at border crossing stations," Elkins noted. "The system is fully ready for implementation to help stem the flow of contraband, thwart fleeing criminals, and detect potential terrorists and many other applications in the effort to secure international borders." Sure would be nice if they would put one of these on every "news" program and "news"paper around the world. It would be interesting to see who the REAL purveyors of fake news truly are! This kiosk looks exactly like the one in the movie 2001 Space Odyssey. And that movie was made in 1968. And I'm your fake news detector as well. More tools for Big Brother. I used to think Canada was our friend, until they asked me to come up and teach a seminar on Powerline Harmonics. The folks at the border accused me of coming in to take jobs from the Decent Folk, when I did not want to do the job, anyway. Because of their fees, I lost money on that trip. Canadians can smell a pathological lying psychopath from a mile away. Canadians can smell a pathological lying psychopath from a mile away." Yes. That's why so many of us give your anti-science brain f@rts those 1 ratings so often. You can bet the "Guvmunt" will have these, and if it mistakenly "thinks" you are lying, you are gone, . . into a small cage somewhere. They will be prohibited in Washington DC. No it means YOU will be prohibited in washington dc. Kiosks will be tuned to your specific patterns. "the particular stare of the psychopath - it is an intense, relentless gaze that seems to preclude his destruction of his victim or target. Women, in particular, have reported this stare, which is related to the "predatorial" (reptilian) gaze; it is as if the psychopath is directing all of his intensity toward you through his eyes, a sensation that one woman reported as a feeling of "being eaten." They tend to invade peoples' space either by their sudden intrusions or intimidating look-overs..."
Get to you, "otto"? You silly incomplete folk are interesting in your predictability. Some of you are enslaved to your fixations on me. It is a beautiful example of how emotions can trap some folk into reactive self-repetition, . . and personal character revelation. Meanwhile, the government is going to use this stuff on us. Good, use it on me. I don't care, just let me board a little faster and not stand in line waiting. Canada is our friend, because it is smart enough to be suspicious of you, Gkam. Sorry about that because it was supposed to be a 5 karma points, not the 1. I wouldn't want the glam-Skippy to get the wrong idea and think I don't agree with you about the Canada peoples being smart enough to be suspicious of him. Neat, so if I realize that my keys are potential weapons, do I get arrested for carrying keys to my car and my house because I darted my eyes around when asked if I was carrying any weapons? For that matter my hands and feet are weapons. And I know that. What now, numbnutz? As always, the question is, quis custodiet ipsos custodes? Wow freaky, I edit my post and it makes a new post. Bug in the posting algorithms noted. Not convinced this kiosk is a good idea. As someone who wants to circumvent one I'd buy one and train myself to dupe it (just like ace liers can train themselves to dupe polygraphs). That is something you cannot do against a human 'detector'. While you can train yourself not to show the signs that human security personel are trained to recognize there is always that element of not knowing what exactly they are looking for. With a kiosk you know exactly what it#s looking for - and that's its weak point. Anybody who wants to figure out how to lie to human personnel can do so. A computer is even easier to fool, and over time the methodology will be far easier to work out, since computers are not as sharp as people. A computer is only as good as its programming. OK, so the computer detected a lie. What exactly is the human subject lying about? The psychopath takes a dump here every day because it's the only way he can get the attention he feels he deserves. He's right - it is the only way. Consider that when you're finally gone, nobody will give it a second thought. It will be like you were never here. No legacy, no impact, no nothing. Not even a hole. No matter what you say, no matter how hard you try. As someone who wants to circumvent one I'd buy one and train myself to dupe it (just like ace liers can train themselves to dupe polygraphs).